Who was it that decided appendding “-er” to the brand would form a suitable descriptor? If you think about it, the label spelled out would be “International Business Machines-er” (or “International Business Machiner” if I was feeling generous). We’re not the only ones. At Google recently, ex-Late Show host Conan O’Brien made mockery of – that’s right – Googlers. A long (but hilarious) video of Conan O’Brien’s visit to Google. The bit about “Googlers” is at 1:35. Used to describe a colleague that takes great pains to show care for yourself and others. Or mutter it under your breath so that it sounds sounds like sociopath. These guys are the ones who have been in the company for a long time, and resist any attempts to adopt new business techniques or technologies. They prefer to continue in their backward ways. The corporate under-class, downtrodden and unappreciated. These folks have usually come into the business through an acquisition, or else they’ve been with another company for some length of time before starting at IBM. Try as they might, they Just Don’t Get It. Regardless of how many times you’ve explained it, or how much training you put them through, they refuse to do things the IBM way. Who cares that it’s faster, easier and cheaper if it doesn’t require 20 levels of management sign-off? That’s just how we do it in IBM. Strange creatures that manage the deeply arcane aspects of the business. Often heard speaking in alien language with phrases that resembles English, but are completely unintelligible, like “all hands meeting”, “business as usual” and “drop-dead date”. How does your company refer its employees? 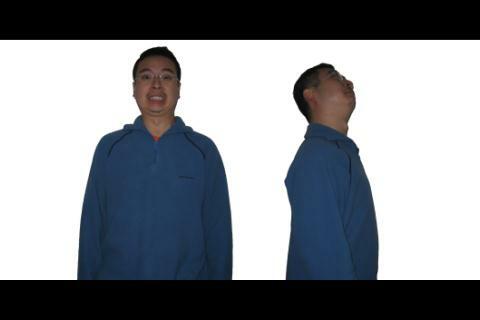 Some of you might have missed this little tidbit in the latest issue of A/NZ Newslinks, but STG is changing the name of eServer xSeries to IBM System x�. In most regards, I’m quite happy that they’ve finally dropped the very awkward eServer branding (the capitalisation of it never really fit very well with that of the other products, e.g. ThinkPad, ThinkCentre, IntelliStation, etc.) however I still have some reservations about retaining the lowercase “x”. Granted, IBM now has to differentiate itself from the brands that it sold off to Lenovo, but maybe there should have been a move towards integrating other IBM product and service offerings into a single, consistent messaging (or naming) scheme. For example, take the Lotus software range, where each application has a functional, descriptive name: e.g. Lotus Learning Management System or Lotus Web Conferencing. … or something to that effect. Customers would be able to differentiate our product offerings immediately, without having to wade through various blurbs and summaries about the product range (does the average Joe even know who an iSeries is aimed at?) I know that my thinking doesn’t take into account the probable multi-million dollars worth of research into marketing, branding and customer research, and far be it from me to suggest that I could have done a better job (or come up with a better name), but I still feel compelled to say that I’m disappointed with “System x” – a name with such forced mediocrity that it can’t even afford to capitalise the “x” for fear of seeming pretentious or rude. Ah, the travesties that marketing-types continue to inflict on the English language. 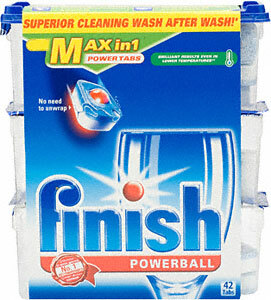 Exhibit A: Finish Max in 1 dishwashing tablets. Prior to moving into our current apartment, I had never lived anywhere that had a dishwasher, nor used one before. Therefore I was completely ignorant of the dishwashing detergent arms race that was happening all around me. Crockery Decontamination Engineers (as I’m sure they’re called) battled each other, through feats of arcane alchemy, for Ultimate Cleaning Glory! Hence, we have dishwashing tables that boast an increasing levels of sophistication: 5-in-1, 7-in-1, I think I’ve even seen 15-in-1. But now, they must all bow down to the new Finish MAX-IN-1! Executive: OK team, sales are down, the economy is tanking, but I still need to finish paying off my boat. What have we got? Marketing: Well, those other guys are starting to sell their 15-in-1 tablet. Um… maybe we could do 20, or 30-in-1…? Executive: No, no… we need something… bigger! Executive: Can you get bigger than that? Executive: Dammit, work with me here! Marketing: What about… “Max” as in “Maximum”? Executive: Max-in-1… hmm… I like it! Let’s go with that. At this point, you can imagine Strunk, White, the Fowler brothers and Bryson all rolling over in their graves. Well, Bill Bryson isn’t dead yet, so maybe he turned in his sleep or something. 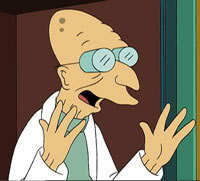 Good news everybody, it’s bad news! There’s a saying: “no news is good news” which, in the days before telephones and e-mail, was used when a lack of information (“no news”) indicated that nothing bad had happened (“is good news”). The News industry wouldn’t survive if they weren’t able to supply a constant stream of compelling information, and it seems the topics people find most interesting are stories of miserable things happening to other people. Is it possibly because it makes our own miserable lives seem less so? (Why am I talking so much about miserable things lately?) We live in an age of cheap, instant communications, but this only seems to help propagate more bad news (and bad jokes). I think that’s why my online reading list doesn’t contain any news feeds. For me, no news is good news. In last week’s Saturday Sydney Morning Herald, a reviewer of Beowulf said “I was expecting a craptacular”. His unmet expectations notwithstanding, I found it somewhat curious that he had used “a craptacular” instead of just “craptacular”. Yeah, yeah… it’s not even a real word – it’s just one of those stupid Internet concoctions, a combination of “crap” and “spectacular” – but because it appeared in the mainstream press, I’m allowed to get worked up about it. The Urban Dictionary defines it simply as “spectacularly crappy” and cites Bart Simpson commenting on Homer’s Christmas lights (“It’s craptacular”)*, amongst others, as examples of its use. Ah, such is the folly of being a grammar geek. * An audio clip of this is available here. ** I didn’t actually know this, I just looked it up to make myself sound smart. While everybody is debating the merits (or lack) of the government’s new workplace reforms, I’d just like to ask what would have been wrong in putting a space between the words, ie. 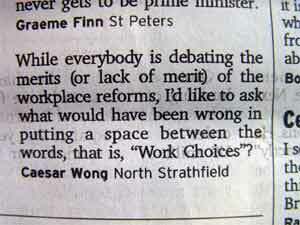 “Work Choices”?